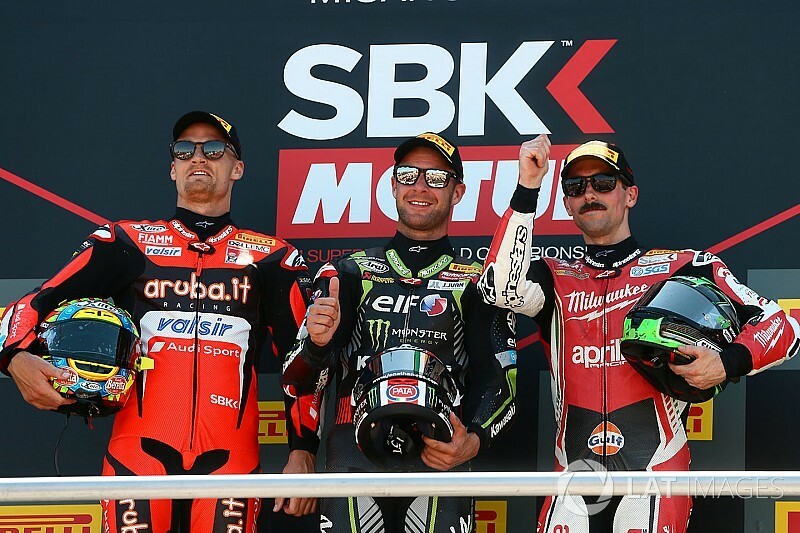 Jonathan Rea eased to World Superbike victory at Misano in Race 1 from second on the grid, while Chaz Davies and Eugene Laverty completed the podium. Rea and poleman Tom Sykes ran side-by-side into the first corner off the line, with the former getting ahead under braking, while Ducati's Davies shot up from seventh to fourth behind Aprilia's Laverty. Laverty hunted down Sykes over the next four laps, while Rea steadily opened up his advantage to close to eight tenths of a second. Sykes succumbed to the pressure of Laverty at the first turn at the start of lap five, and before long Davies was hounding the Kawasaki man for third. Laverty kept Rea's lead at eight tenths briefly, but Rea soon responded to the Aprilia's rider's advances and opened up his gap to over a second. On lap six, Davies launched his Ducati up the inside of Sykes for third and began his chase of Laverty ahead. Davies steadily brought the gap to second down, and he pounced when Laverty ran off track at the final corner with five laps remaining. 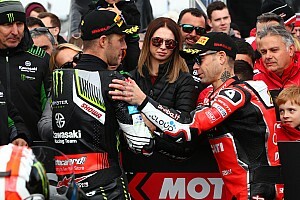 Rea remained unchallenged to the chequered flag to extend his championship lead to 80 points with his ninth win of the season. Laverty was unable to make amends for his off-track excursion and gave Davies a comfortable run to second, with the Aprilia rider completing the podium. Yamaha's Michael van der Mark found himself inside the top five on lap nine having started from 11th, and carved past Sykes at the Carro hairpin with nine tours to go. Van der Mark did close Laverty down over the final few laps, but remained fourth. 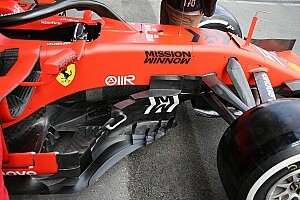 He will start Race 2 from pole position as a result. Sykes was a lonely fifth at the flag ahead of Xavi Fores, while Ducati stablemate Marco Melandri seized seventh after a hard fight with the second Milwaukee Aprilia of Lorenzo Savadori. 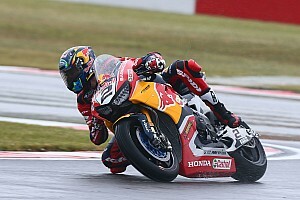 Leon Camier got his Honda home in ninth, while Leandro Mercado took his first top 10 result since May's Imola round. 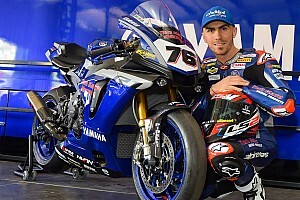 Loris Baz (Althea BMW) crashed at the Park chicane at the start, while Yonny Hernandez (Pedercini Kawsaki) fell at Rio just a few laps later. Alex Lowes (Yamaha) crashed twice, re-joining from his first off at Quercia on lap six before tumbling out of contention at the Park chicane four tours later.